TULARE – A ceremony honoring more than 200 deceased indigent people was held on March 28, 2014 at Tulare County Potter’s Field, located just north of Traver on the northwest corner of Road 36 and Ave. 376. The deceased were interred at Potter’s Field as part of the Tulare County Health & Human Services Agency’s Indigent Burial Program, which is designed for people and families who do not have the funds to pay for a burial. A potter’s field is a term for a place for the burial of unknown or indigent people. As a part of the program, the deceased are cremated and stored at the Kingsburg Cemetery District until a burial can be performed. The last time a burial was conducted was 2006. In January, Tulare County announced the date of the internment and encouraged family and next of kin to claim the cremains. Since then, three cremains have been collected. 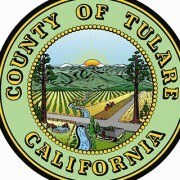 Tulare County recognized a variety of partners who have stepped up to renovate Potter’s Field after it’s landscaping and maintenance was criticized by the Tulare County Grand Jury in October 2013. After the brief recognition, a ceremony was conducted by the Kingsburg Ministerial Fellowship. The ceremony included various readings, hymns, words of committal, the reading of the deceased names, and a rendition of Amazing Grace.